Felton Brushes has the capabilities to manufacture Crab Butchering Brushes. These brushes are used by crab processors during the cooking and cleaning process. Our crab brushes have been used in the industry for years. They are made using top quality aluminum extrusions and tough, durable polypropylene fibers. History has proven they will outlast the competitors. 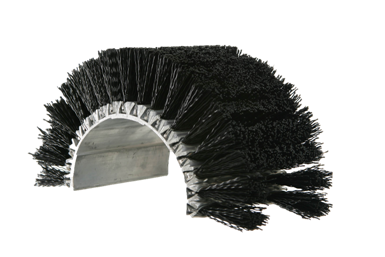 These brushes are made using strip brushes inserted and fixed into an aluminum extrusion. Sold in pairs and manufactured as halves these brushes are assembled using aluminum holders and are mounted onto a 1ine shaft. They are stocked in 4″ sections using .030 or .040 Crimped Black Polypropylene.